Here's the deal: I know nothing about home improvements. As in, I can change a lightbulb and paint a wall, and know how to keep it all clean, but that's about it. I chose to buy a brand-new condo for a reason; new homes, especially those with no lawns or exteriors to be responsible for, bring far fewer maintenance issues. Even still, my water filter light on the fridge has been on since I moved in, and I just recently discovered that oops, there was never an air filter put in place. I promise I am not a girly ditz. I just have other areas of interest. Like shoes. And wine parties. Even with just a mere 1000 square feet to think about, there are things that I want to do to increase the standard of living within those walls. And 2011 seems a better year than ever to start to tackle these projects. I have some budget flexibility, and I also have a lovely man around who actually likes doing home improvement projects. Score! So here are the things I have my eye on for the near-term. Added up, they sound like a few weekends of "nice little Saturdays" ahead, what do you think? Are any of these things on your To-Do (or Honey-Do) lists? 1. Install track lighting under my kitchen cabinets. There is a dark corner in the kitchen caused by the overhead track lights that falls smack dab on one of the main prep areas. Cutting vegetables and meat with really sharp, pointy knives makes me kind of nervous as a result. I feel like this should be an easy fix, and I could even make them the mountable kind that don't require any wiring. 2. Install pull-out shelves in my cabinets. This is a daily irritant for me. I have a lot of storage space for a condo, but it was not well-designed. All of the cabinets are 2+ feet deep, making it impossible to see the items towards the back. Dishes and pots are a pain to pull out from behind others, and I can't see most of my baking shelf in the pantry. Pull-out drawers would solve this in an instant. I am thinking ones like these (oh how I love the Container Store!) 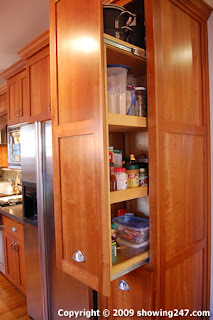 For the tall, narrow pantry, I am lusting over something like on the right, even though that would be a total custom job. Love. 3. Hang up paintings and pictures. Our building has cement interior walls, making hanging things not an easy activity. Hammer drills are absolutely required (even regular drills with cement bits don't make it through! ), and cost around $60 for a few hours of rental at Home Depot. We have a lot of hanging to finish up, so a rental is in the near future. 4. Install curtains/panels in the bedroom and living room. Again, cement walls mean a trip to rent the hammer drill, and 10 feet ceilings and picture windows makes this task a tad precarious for not only installing, but buying/making said panels. 5. Repair the caulk and cement edges in the tub and shower. These both have gone downhill in the last number of months. The saddest part? I bought the supplies I need ... now just to figure out how to actually DO it all, especially the cement-sand edges. so many things i want to do to the condo i live in, but alas, it isn't mine. i might talk to the owners about doing these things and having them just pay for the materials. Great article! Home improvements add so much value to your home! Katie - you totally should do that. We have a friend doing that, and he is actually getting free rent out of it, too! It's a house, and he is essentially helping the owner flip it, re-doing floors, bathrooms, kitchens and more. He loves handiwork so it's a perfect arrangement; "free" labor for the owner, free rent and fun things for him to do, too!